Why would someone produce an excellent browser-based productivity app like donedesk and make it available, free of charge, to individuals and teams alike? The key to answering this question can be found in the history and objectives of a company called Priacta. Priacta focuses on time management training, coaching and software. They have developed an approach called total, relaxed organisation (TRO), which they see as building on the work of Stephen Covey (The seven habits of highly effective people) and David Allen (How to get things done. The art of stress-free productivity). Priacta presents its TRO model as an innovative workflow and time management system that can free up almost 600 hours per year. Their website outlines the differences between the GTD® and TRO approaches. The folk at Priacta have certainly done their homework: one of the features of their website is an interactive software comparison table that describes the key features of more than 160 productivity apps and lets you compare them from the perspective of their compatibility with the Getting Things Done® (GTD®) and Total, Relaxed Organisation methods. The Priacta team did not stop there, instead developing a productivity app of their own. Enter donedesk (drumroll). Donedesk is free because Priacta expects to derive its income from training. There is also a more pragmatic reason: collaborating with others requires a shared software platform and requiring payment for an app would limit its uptake. It is worth noting that TRO does not require the use of donedesk; Priacta delivers TRO training built around any compatible app that the client is already using. I am not connected in any way to Priacta but I like the integrity of a company that rates its own app, donedesk, a modest 5.5 on a (gruelling) 10–point scale. Asana, a very similar app, receives the same score. Priacta rates Omnifocus a low 3.5, citing the app’s lack of support for teams and collaboration, while the older but feature-rich ToodleDo scores an impressive 7. Let us now look at what donedesk has under the bonnet. You create a donedesk account by registering with an email address and a password. 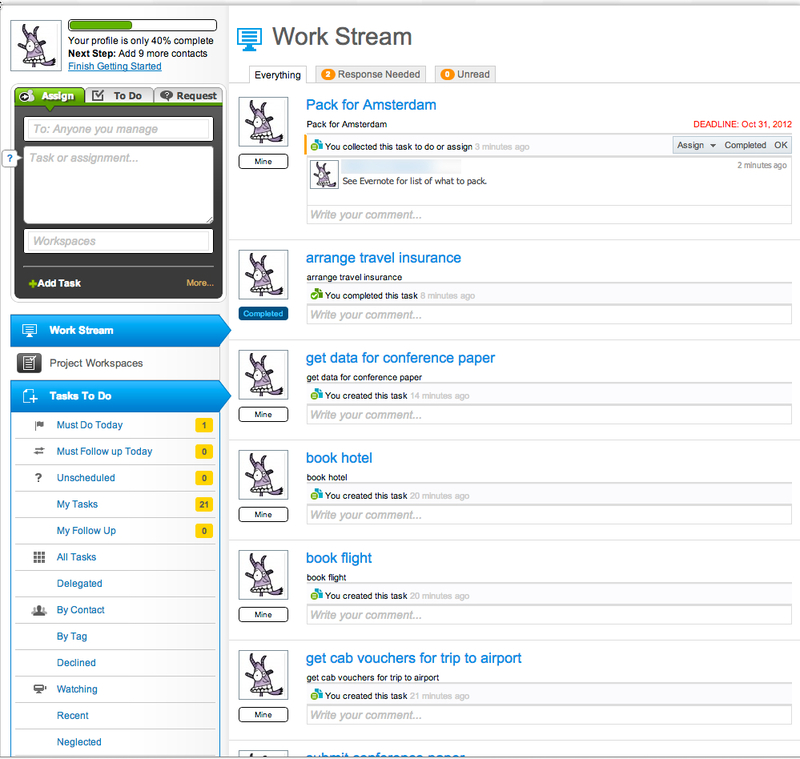 Your donedesk homepage is the work stream view (see screenshot 1). It provides an integrated view of recently added tasks across all workspaces, with tabs marking tasks that are unread or require a response. If you integrate donedesk with your email account (which I have not done for this review), your email messages will form part of your work stream, along with task updates and comments from co-workers. You can add contacts manually or import them from your address books. You can collaborate on tasks or projects without your contact having to use donedesk. The manage workspaces view has tabs that show which workspaces are active, completed or stalled. 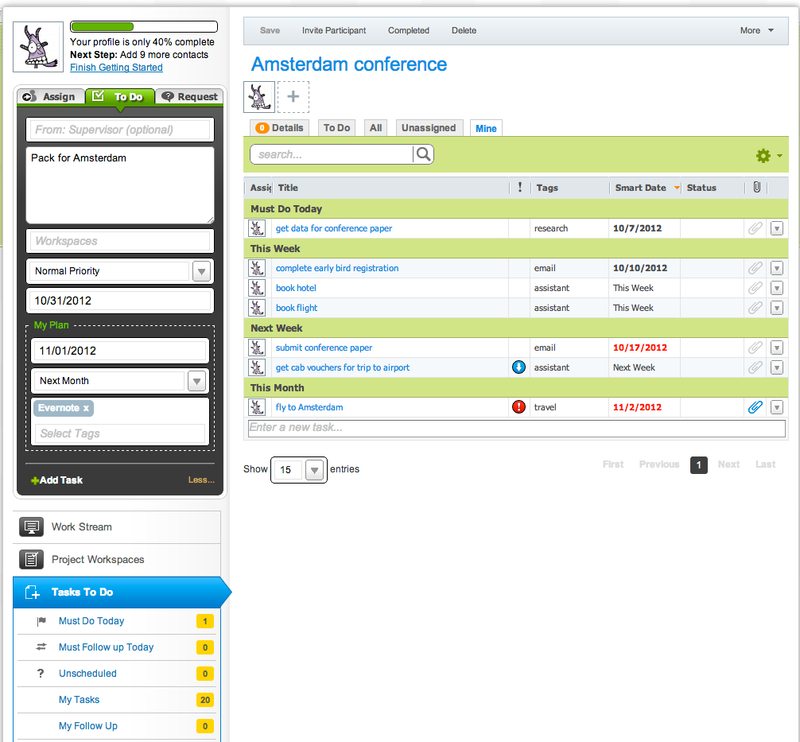 The screenshot below shows the task list view for the ‘Amsterdam conference’ workspace that I have created for this post. The Donedesk task list view for my ‘Amsterdam conference’ workspace. I am not really worsening my carbon footprint by flying to Amsterdam; just recycling a sample project. The navigation pane on the left contains a task entry box and below that the primary donedesk views: work stream, project workspaces, tasks to do, discussion, contacts and files. The task entry box can be expanded or collapsed to give you more or fewer options for setting task priority, tags and timelines. Donedesk lets you assign up to three dates to a task: an aspirational soft date, such as ‘this week’, which indicates when you would like to start the task; a hard date, by which you really should start the task in order to be able to complete it on time; and the actual deadline. Donedesk handles scheduling really well, with the app effectively escalating task urgency in line with your instructions. Enter a due date, and donedesk will schedule the task a couple of days beforehand. Postpone a task for too long, and the hard date (shown in bold black type) will be replaced by the looming due date (shown in bold red). It is in fact a way of automating part of the GTD® review process —and one of the many instances where you get the feeling that the developers have thought long and hard to come up with a simple solution that makes good sense from the user perspective. Another nice touch is that, whereas the deadline is fixed, soft and hard dates pertain to personal planning and can can therefore vary across team members. Donedesk supports multiple tags, three levels of priority and lets you attach notes and files to tasks. You can add a task to multiple workspaces at the same time. As all tasks and workspace names are hyperlinks, it is easy to switch between task list and project views. You can also customise your notification settings and receive email reminders in which the tasks are hyperlinks: open them from the email and edit as required. The functions I have described so far are those that I have been exploring within the context of individual task and project management. In terms of what donedesk can do, that is only the tip of the iceberg. When it comes to team collaboration, you can, for example, use donedesk to set up a delegation chain, automate task follow-up, or help your team to collaborate in real time. The Priacta website showcases a nice example of how to support an online meeting in real time, using a donedesk workspace to compile the agenda and to assign tasks as they arise from the discussion. free — for both individual and team use. Donedesk is a capable task and project manager that is easy to set up and use. It provides helpful monitoring tools, such as an integrated task view across all workspaces, or the capacity to identify projects that have stalled. It could be further strenghtened by the addition of subtasks, the capacity to create repeating tasks and the development of a mobile app. While donedesk supports individual task management, it is designed primarily to support team collaboration. Its strengths include task auto-prioritisation, email integration and the capacity to integrate individual planning and working styles with team deadlines. Collaboration does not require your contacts to use donedesk themselves; and the app is—and will remain—free, irrespective of the number of users. Have you used donedesk? Please leave a comment below to share your experience with us. Update (5 September 2014): Donedesk will be discontinued from 30 September 2014. This entry was posted in productivity and tagged covey, donedesk, email integration, free software, GTD, productivity, project management, team task management, to do app, toodledo, TRO by Gilbert Van Hoeydonck. Bookmark the permalink.